A fellow member of our local quilt guild, Chris Wickert, has donated one of her quilts as a raffle fundraiser for a local hospice, Isaiah House. 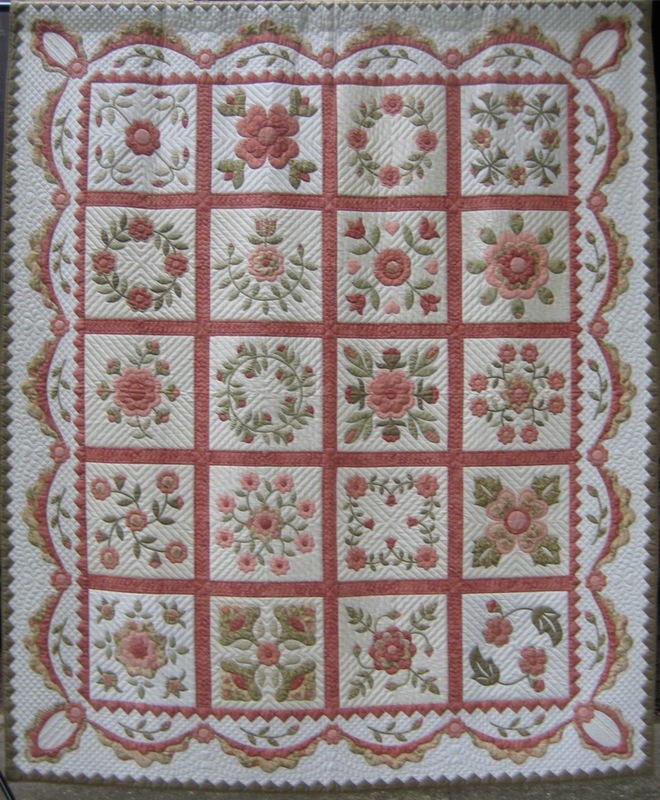 Chris is a truly exceptional quilter whose workmanship we have all come to admire for its high quality. 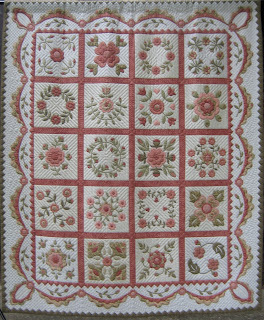 The quilt she has donated is called "A Rose is a Rose... " It is hand appliquéd and hand quilted, queen size (81 X 94), and was made by Chris in 2001. Isaiah House performs an incredibly valuable function in our community here in Rochester, NY and is in threat of closing if it cannot raise sufficient operation expenses. The raffle tickets cost $2 for one ticket or $5 for three tickets. If you would like to help out, you can send a check (made out to Isaiah House) along with your contact information including phone number to Chris at Christine Wickert, 94 Camberley Place, Penfield, NY 14526. She will fill out your ticket(s) and put them in the ticket pool. You can contact her at cwickert@frontiernet.net if you have any questions. The winning raffle ticket will be pulled some time before Christmas 2011 (date to be determined). You need not be present to win. As I said before, Chris' work is amazing. This is a great opportunity to give to a good cause and perhaps win a truly special quilt. Kristine Catalano, the director and the volunteers at Isaiah House are taking loving care of my sister Monika free of charge as they have taken care of all previous residents since the Isaiah House was founded in 1987. Monika herself volunteered at the House and now the roles are reversed! I had no idea what the House was all about until this year. And when I learned that it was in financial distress, I knew that "A Rose is a Rose..." finally realized its destiny! Thank you, Judy Warner, for publishing this in your blog! I hope many of you out there open your generous hearts!